Welcome to Lovejoy Cottage! You can expect to wake in the morning to the sound of songbirds and look up from your comfortable bed to see the mist rising off of the glassy pond, looking across to the undisturbed marsh and picturesque farmland. 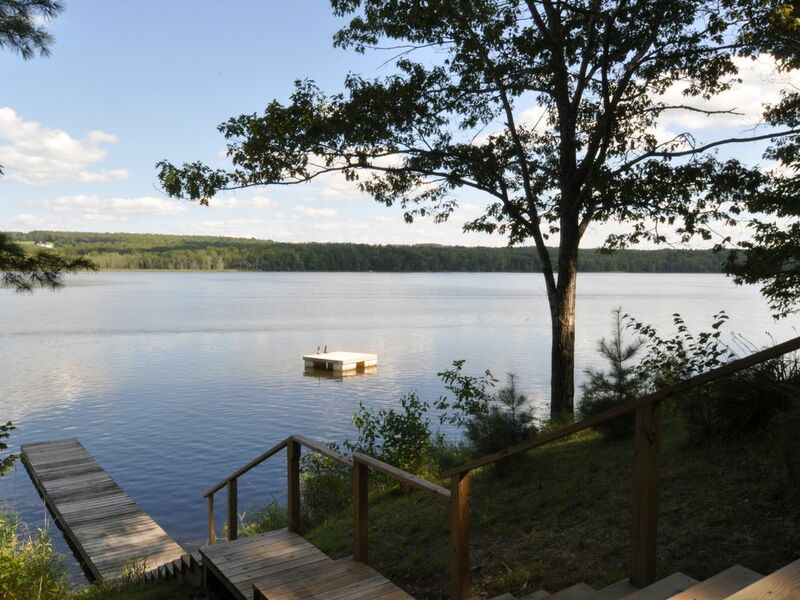 This cottage is the perfect peaceful getaway, with a comfortable, cozy interior, calm waters with a dock and float, and a two-person kayak and a canoe for your you and your family to explore scenic Lovejoy Pond. Kayak past the uninhabited island, or enjoy picnics at the edge of the meadow just a short walk down a deserted wooded lane. The cottage is just 15 minutes from the historic town of Waterville with its theaters and restaurants, and just 25 minutes from the famed mid coast area. Belfast and Camden are renowned for their excellent restaurants, shops and antiquing--and Camden Hills State Park boasts some of the loveliest views and hiking in the State of Maine. The bathroom is small but has everything that you need. It was completely renovated in 2011. Brand new air conditioning and heating unit added in 2016, great for those too-warm summer days! Tandem kayak and canoe provided. Air conditioning installed in 2016. The kitchen was fully renovated in 2012 and is fully equipped with plates, pots/pans, silverware, and glasses. Canoe, two-person kayak, paddles and life vests, including child sized, on site and free for guest use. This is a strict non-smoking property; pets not accepted. Lovejoy Cottage was all we hoped for and more! We stayed here to be close to the coast and Acadia National Park, but far from the bustling crowds. The cottage was lovely and located right on the water. It was impeccably clean and obviously well cared for. The sunrises are amazing and watching the mist rising off the water was a special and rare treat. We saw tons of birds, including a great blue heron (!) at the shore, and even wild turkeys! This was such a relaxing place to return to after a full day of sightseeing and touring. We enjoyed fires in the fire pit and heard the wonderful call of the loons. Next time we plan on just doing nothing but kayaking, fishing, and relaxing on the deck with a glass of wine. This is truly a magical place and I can't wait to come back. Thank you - we are so glad you were able to relax and enjoy Lovejoy Cottage! As you found, we are close enough to everything, but just far enough away for quiet, relaxation, and privacy. We love that you saw the heron and wild turkeys and can't wait to welcome you back! Lovejoy cottage is a beautifully appointed cottage. It's a great place to relax and unwind. The cottage has all the necessities for a relaxing time. Lovejoy pond is more for fishing, kayaking and canoeing than swimming. The sun rises and sunsets are breath taking. Thanks for the rave review of Lovejoy Cottage! We too think the sunrises and sunsets are spectacular!! Our guests love the quiet nature of the pond for kayaking, canoeing, and fishing, and some do swim and enjoy the swim platform (as do the cormorants)! This year's excessive heat was particularly hard on the pond and resulted in some algae growth along the shore during late summer, making swimming less desirable. In situations like this, and for those who prefer a beach-type environment, we provide directions to a nearby state park with sandy beaches and lifeguard on site, as well as to a "locals-only" favorite swimming hole. We look forward to hosting your family again! The cottage was exceptionally clean. Very nice. Yard and dock were nice. The wildlife seen was amazing. Extremely peaceful and quiet. The ponds' water quality was not good for swimming. Thick green algae which sometimes had an odor. The fishing was fair. Over all we were very happy with our time at this cottage. The owners even left us a personal note and a welcome gift bag which was very thoughtful. And, we wish to thank them. We are so glad you enjoyed your stay at Lovejoy Cottage and found the area very peaceful and quiet. So many of our guests come here to unwind and relax and leave fully refreshed and recharged. We love the wildlife sightings too -- we get spoiled with our bald eagle families but also love the cormorants that are so very entertaining! We look forward to welcoming you back. Love joy Cottage is a charming place. We had a wonderful time cooking in the fully equipped kitchen, having coffee on the back deck watching the beautiful sunrise over the pond and seeing the variety of birds sunning themselves on the dock. We also enjoyed sitting around a warm fire in the fire pit in the evening. The cottage was very clean and furnished with lovely touches of Maine. Would love to go back and try out the fishing! Thank you! We're glad you enjoyed the quiet, undisturbed nature of the pond and all the wildlife, and that we were so convenient for your visit to the Common Ground Fair. Come back for the great bass fishing! For us, way too far from our usual places (mid-coast). Lovely site. Thanks for your admiring words about Lovejoy Cottage and its secluded location right on Lovejoy Pond. It's a great place to relax and use as a base to explore all that Maine has to offer. We're only 25 minutes to the famed mid-coast, two hours to Acadia National Park, and one hour from L.L. Bean! This very peaceful and tranquil place makes for a wonderful and memorable vacation to Maine. This cottage is seated on a pond with so much wildlife in a great setting. I highly recommend it!!!! Thank you! We're so glad you and your sons were able to make lifetime memories at Lovejoy Cottage. It's definitely a respite from hectic city life, and we look forward to welcoming you back in the future! This cottage is located on Lovejoy Pond in Albion, ME, just outside of Unity. Albion is a landscape of rolling hills, picturesque farms and beautiful pastureland. Unity is home to a wonderful weekend farmer's market and the beautiful demonstration gardens and orchard at the Maine Organic Farmers and Gardeners Association. Albion is also only 15 minutes from the historic town of Waterville with restaurants and movies, and just 25 minutes from the town of Belfast on the coast. Belfast, Rockport, Camden and Rockland are all nearby coastal towns renowned for their excellent restaurants, great antiquing and shopping, and thriving arts scene as well as spectacular coastal scenery. Camden is home to the Camden Hills State Park, where visitors can climb Mt Battie for a stunning view of the harbor and islands. Camden is routinely listed as having one of the most beautiful harbors in the world. Other Activities: Bird watching, farmers markets, country fairs. Rental weeks run Saturday to Saturday. Check in time is 3:00 pm and check out time is 11:00 am. No smoking in cottage or on property. No pets accepted. Not suitable for toddlers. Signed rental agreement and copy of photo ID required before reservation is confirmed.